glasseyedave	The Gospel the church refuses to believeArminianism, Calvinism, eternal security, holiness, Perseverance of the saints, Repentance, rightouseness, The gospel according to the gospel, The Gospel the church refuses to believe, Wages of sin is death, What did Paul mean by the wages of sin is death?, What gospel did Paul preach? In the book of Ezekiel it is stated no less than 4 times in 2 different places that the man who sins will surely die in his sins. But if he repents from his sins and does them no more, then shall he not die in his sins. If a righteous man lives righteous all of his life but in the end he does wickedly none of his former righteousness shall be remembered, he will die in his sins. See Ezekiel chapter 18 and 33. Many believers will immediately respond that this is the Old Testament and we are under the New Testament. So what did Paul mean when he wrote the wages of sin is death? Did Paul preach the wages of sin is death from his draft new testament? What was the source document of Paul’s gospel in which he would teach that the wages of sin is death? What gospel was he referring to when he said in Romans that he was not ashamed of the gospel? When Paul wrote the letter to the Romans he said that he had not been able to go to Rome yet. But in the book of Acts, in the very last chapter, in the last half of the chapter, we finally see Paul preaching to the Romans. Here in scripture it is revealed what Paul’s gospel really was when he said. “the wages of sin is death”. Whether he was preaching from his parchments that pertained to some secret new gospel apart from the Old Testament or some other place, we can now know for surety what his gospel was when he taught the wages of sin is death. The scripture is clear, Paul preached about Christ and His kingdom from the Law of Moses and the Prophets. That is right, Paul is recorded as preaching from the Law of Moses and the Prophets. In fact if you look at Paul closer, that is all he ever preached from according to scripture. This is why there is so much talk of Abraham and circumcision in his writings. Is this any different than what we read in Ezekiel? The man who is doing the sinning dies in his sin. The man who is obeying God is the one who shall reap life everlasting. Again, Paul can be seen writing in his gospel what we have read in Ezekiel. The man who sins is the man who dies. The man who lives righteous is the one who will receive eternal life. If this is the case, then how can we reconcile when we are taught that a believer can sin for an undetermined amount of time doing an undetermined amount of sinning and never be in danger of hell to what Paul actually wrote and preached as part of his gospel? We are taught that we are imputed God’s righteousness. In Paul’s own words the first sign of imputed righteousness a man ever received was Abraham. Paul taught in Romans that circumcision was a seal in Abraham’s flesh of the righteousness he received from God. (Roman’s 4:11) Christians, according to scripture are no longer given a physical circumcision as a mark of God’s righteousness, rather we are circumcised without hands by Christ. The real kicker here is that Paul teaches that we are circumcised by the putting off of the sinful nature. So what does Paul mean when he wrote, “For the wages of sin is death”? Paul clearly teaches us that we will get what we do. That if we live unrighteously we will die in our sins. If we live righteously we will reap eternal life. In fact our being circumcised by Christ only comes in the putting away of the sinful nature. Wow! This not only is so much different than what we are taught, but it also matches what Paul wrote for us in his gospel. The man who sins will die in his sins, the man who lives out his life in righteousness will reap eternal life. Amazingly, this matches the Old Testament that Paul preached from. So for all of those of us who want to claim we have the righteousness of Christ imputed to us, we must look at our lives to know if we really do have Christ righteousness. From John’s letter, the wages of sin is death for any man who does not live righteously, because only those who do righteousness is righteous as He is righteous. This scripture is really in the face of those who want to believe Christians can live in sin and never be in danger of hell. What is the one word missing in all of this? The missing word is repentance. All men have sinned and need to repent. It is not enough to ask Jesus to come into our hearts. We need to repent, turn from our sins and walk in holiness. Only this way will the work of Christ apply to us. Only this way will we be true believers. Those confessing believers that Christ turns away are those who still did iniquity even though they were professing believers. Those who will make it to heaven are those who do the will of the Father, which is to live holy as He is holy. See how it is those who hear the word of God and does it that is considered the wise man who built his house upon the rock? See how it is the worker of iniquity, even as believers that call Jesus Lord, who will not be known by Jesus? Yes, Jesus died for our sins. Yes, we are righteous because we have His righteousness, if we repent and live righteously. Yes, we are circumcised by Him if we repent and put off the sin nature. Yes, the gift of God is eternal life in Jesus our Lord, if we repent and become free from sin and live unto holiness. Yes, we have eternal life, if we repent and live holy. Yes, we love God, if we obey His commands. But now being made free from sin, and become servants to God, ye have your fruit unto holiness, and the end everlasting life. (23) For the wages of sin is death; but the gift of God is eternal life through Jesus Christ our Lord. Through repentance we are made free from sin and become the servants of God, having the fruit of holiness and the end for us will be everlasting life. Yes, the wages of sin is still death, but the gift of God is eternal life through Jesus Christ our Lord. But you can’t get to Jesus without repentance. This is why Jesus said this gospel of repentance shall be preached to all nations. I guess the question we Christians should be asking is, when will the wages of sin no longer result in death for the believer, if scripture teaches that the wages of sin is death. I know this goes against what our leaders and teachers try to convince us of in the name of eternal security that comes from repeating THE magical prayer. 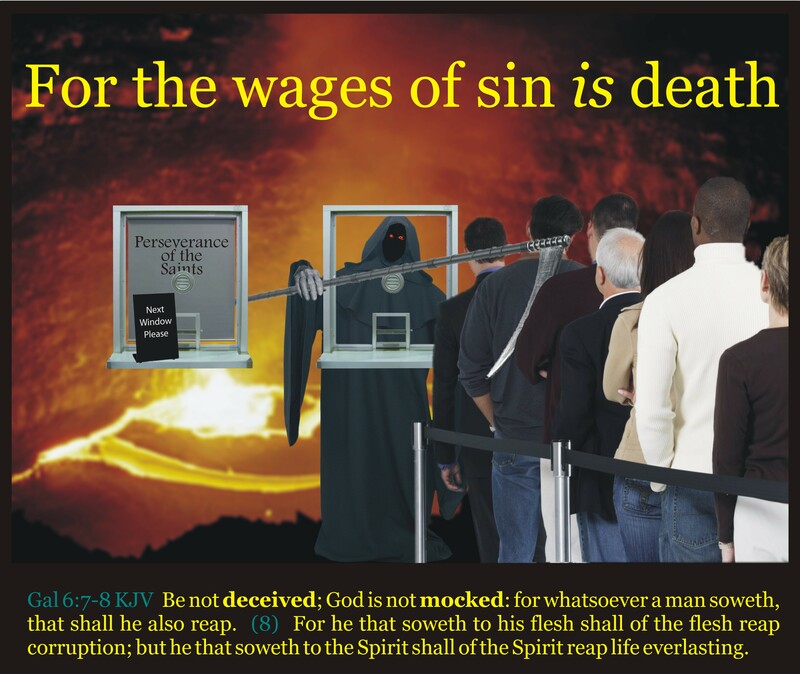 But the wages of sin is death. So when are we going to be free from the wages of sin? Speaking of Christ, Paul says that Jesus must reign until He puts all of His enemies under His feet. The last enemy to be destroyed is death. It is interesting that the wages that sin pays will not be removed until Jesus puts all things under His feet. For he must reign, till he hath put all enemies under his feet. (26) The last enemy that shall be destroyed is death. Paul is very clear, when death will be swallowed up in victory. When we leave this mortal body and receive our heavenly body then death will be swallowed up in victory. Until then, death will be the wages of sin. So when this corruptible shall have put on incorruption, and this mortal shall have put on immortality, then shall be brought to pass the saying that is written, Death is swallowed up in victory. (55) O death, where is thy sting? O grave, where is thy victory? (56) The sting of death is sin; and the strength of sin is the law. Since death is still wages of sin, then let us consider how we live out our faith. Do we live in righteousness or iniquity. There are many more verses that I can throw out here pertaining to the New Testament teaching that. no really, the wages of sin is still death, even if you are a believer. Please feel free to contact me if you would like more verses to study concerning the wages of sin being death. For those who oppose such a teaching, I would like to have you quote for all concerned, where it is said that the ungodly and unfaith will be with the Lord as His people. ← What does Romans Chapter 7 teach anyway? Well, if we as believers say that we will die in our sins and never sin again, then we would be perfect. As we are not perfect even though we are saved. Only Jesus was perfect and never sinned. We try and do what is right. The Holy Spirit convicts us when we sin, and we ask for forgiveness and we are forgiven. 1 John 1:7-9 “if we sin we ask forgiveness and He forgives us our sin and cleans us of unrighteousness”. ” If we say we are withoput sin we are liars”If we mess up we ask and recieve that forgiveness.Thank God we have that grace, and we recieve new mercy every morning! If not all of us are in a world of hurt without that knowledge that when we do sin we ask and we recieve. If you do not ask, you will not recieve. I ask everyday for forgiveness of the stupid things I do or say because I know, I mess up. I probably should ask every hour, because I probably do stupid stuff that often! But Jesus, He is our intersessor! Thank you Jesus! Why is it the church teaches the Holy Spirit’s job is to convict us of sin when we fall. Why not teach what scripture teaches, yes the Holy Spirit convicts us of sin, this is the first part of the need of repentance. The Bible also teaches in so many ways and places that we are to live in the Spirit. Why can’t we say that when we sin we are not living in the Spirit, we are not living according to the gospel? Just because we sin, doesn’t change the gospel. The church has made the gospel a reflection of us, instead of us being a reflection of the gospel.